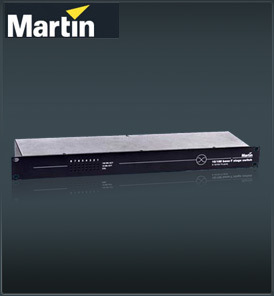 The Martin Ethernet switch is designed to allow full logistic capability within large lighting control systems featuring multiple control consoles and increased numbers of DMX universes. In addition the Ethernet Switch permits you to expand the distance possibilities beyond the conventional 100 meter cable constraints using its internal signal buffer. Working together with the Ether2DMX box and the Neutrik Ethercon converter, the Ethernet Switch analyses the data processing stream and forwards it to the required destination. Its hardware is configured for lighting control applications and routes data between all the equipment connected in the network, detecting straight and cross over cables usage. It connects the network via its 8 ports 10/100 T-base. Ideal for large lighting installation, events, concerts, or anywhere the high capacity Maxxyz or Maxxyz PC controller is used. Expands the networking and distance possibilities for Maxxyz. 8x 10/100 base-T Ethernet ports on Neutrik Ethercon connectors via Martin Ethercon CAT 5 cable and Ethercon converter. Wire speed receiving and transmission. The switch can transmit and receive Ethernet frames at full speed. Auto-negotiation: the switch automatically detects 10Mb or 100Mb devices on its ports and automatically switches between half and full duplex mode. MDI/MDI-X Auto-crossover: you can use straight or crossover cables freely to connect your devices. The switch automatically detects straight or crossover connections and adapts its ports. Wide range auto-sensing power supply 90VAC – 260VAC / 50Hz – 60Hz. The switch is unmanaged. It is hardware-configured for lighting control purposes. 8x3 LED matrix: displays 10Mb activity, 100Mb activity and collision per port. 5 minute address ageing: the look-up engine of the switch will delete the address record every 5 minutes. Maximum frame length set to 1536 bytes. 19 inch 1U aluminum casing. No priorities programmed. Priority schemes are not used.